Having some fun with their new neighbor, Denver Colorado agency Thomas Taber & Drazen created this holiday card which ask those sending "lavish holiday gifts" to address them to the company's new address in Denver. 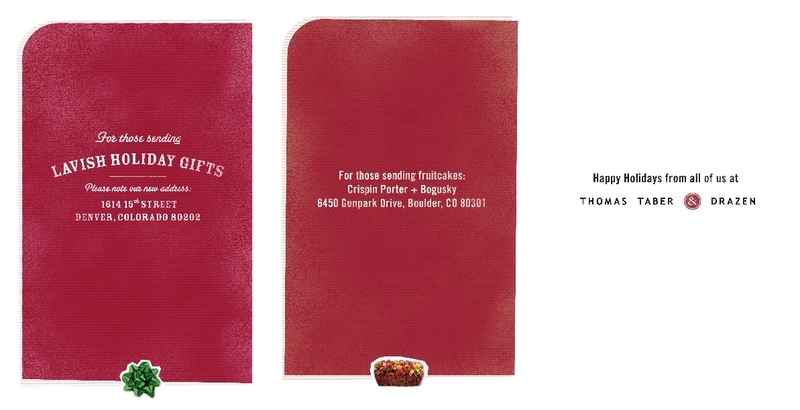 It also directs those sending fruitcakes to address them to Crispin Porter + Bogusky in Boulder Colorado. Friendly joke or just jealous the Miami shop is now in their backyard? I like that a lot. Very cute. Definitely a friendly joke... and a compliment. Denver agencies are thrilled to have CP+B next door.